Borglum informs Alderman that he is sending a photograph of the work in progress. 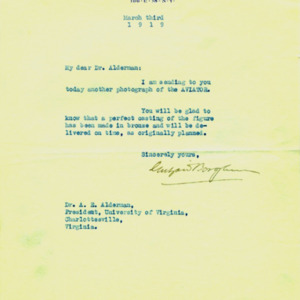 President Alderman writes to Borglum to request that he find the optimal site for the statue when he visits the University. He also requests that the pedestal for the statue arrive, inscribed, at the University. 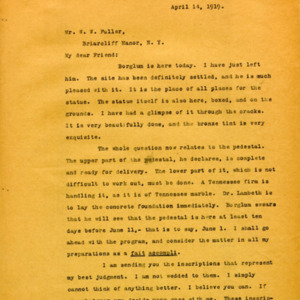 President Alderman writes to Mr. W. W. Fuller to inform him that Gutzon Borglum has found the site for the statue. The statue itself has arrived on Grounds (Alderman took a peek). Alderman also sends an idea for the inscription which he wants Fuller to revise. As an endnote, Alderman mentions the recent donation from Mr. Paul Goodloe McIntire to establish a School of Fine Arts. Borglum informs President Alderman that the stone for the pedestal has been ordered and will be shipped five days before the ceremony. Borglum also adds a note of how beautiful the University Grounds were during his visit. 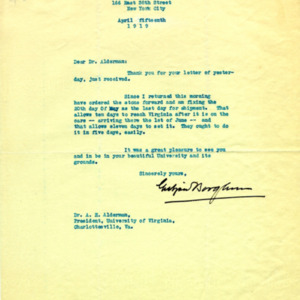 President Alderman writes Mr. Gallagher, an associate of Gutzon Borglum, that he is returning the blueprints of the inscription which were sent to the University. The inscription is satisfactory although Alderman is unsure about which direction the inscription should face. Borglum is now in Cuba. Sarah Rogers McConnell informs Alderman that she will be unable to attend the unveiling ceremonies on June 10th. She thanks President Alderman profusely for being the "instigator" of this great honor to her son. As the ceremonies grow closer, Alderman grows more and more uneasy. He inquires to Borglum's secretary, Eugenia Flagg, to send some word on how the base of the statue is coming along. Telegram from Eugenia Flagg saying that the base is almost completed. 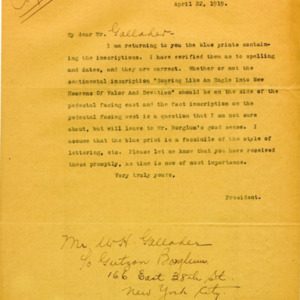 Miss Eugenia Flagg writes a follow-up letter to Alderman after she sends the telegram. She has had daily contact with the contractor. Miss Flagg is handling the matters of the base as long as Borglum is still in Cuba. Eugenia Flagg breaks the news to President Alderman that the stone for the base will have to be shipped uncarved to Charlottesville. Difficulties with the stone prevented the carving of it. So it will be sent to Charlottesville for the ceremonies, and then carved after the ceremonies by Borglum's best men. Borglum at this point is still in Cuba. Miss Flagg adds a hand-written note expressing her vexations at this unfortunate situation. Alderman agrees that the situation is deeply regrettable but requests that the stone be shipped one day earlier than planned. He reminds Miss Flagg the consignor of this project (Borglum et al.) has the influence to demand such an action from the contractor. Alderman inquires of Miss Flagg whether Borglum will be able to superintend the erection of the statue since the University lacks the needed instructions. 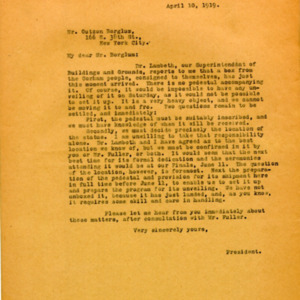 Miss Flagg informs President Alderman that Borglum will not leave Cuba for another ten days, but he is sending one of his sculptors to superintend the setting of the base. 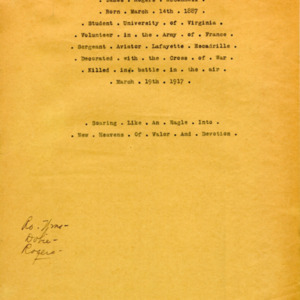 She encloses explicit directions on excavating the foundation for the base, an instructional drawing, and the definition of a technical term "one man stone". 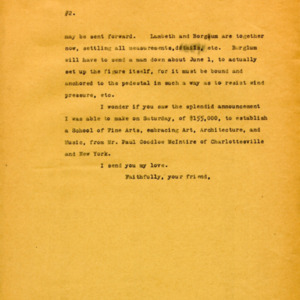 Miss Flagg informs that a Mr. McMahon will arrive in Charlottesville to set up the base and complete the carving of the inscription. The ceremony has occured, as President Alderman writes, in a most decorous fashion. But he writes that the last minute proceedings in securing the statue to the pedestal were unnecessary considering the two years of planning involved. He does not blame Gutzon Borglum in the least, but he does express his diappointment clearly. Alderman requests that someone be sent to secure the statue to the pedestal properly.